The Squashed Bologna: a slice of life in the sandwich generation: Alright? Alright! Well, no time for the niceties, I have to get back to my nap. But I just wanted to let everyone know that I am alright. Waiting in the prep room. Thanks for keeping me laughing, husband! 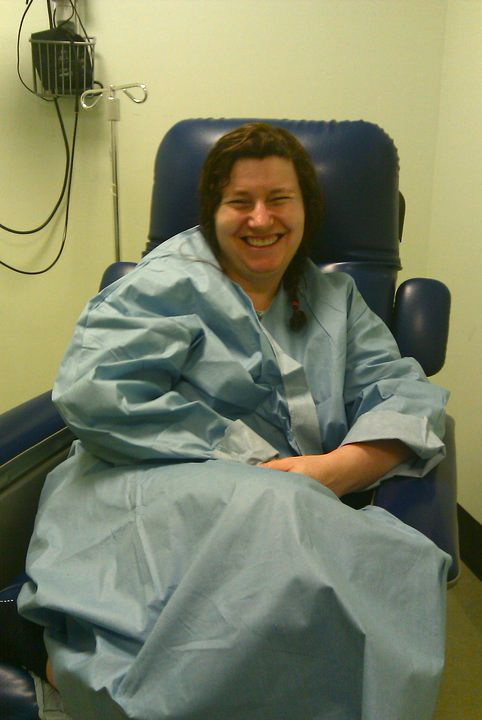 The surgery went well, as expected; routine; a big yawn for the surgical team; just as we wanted it to go. I got home the same day, in the evening (just in time to kiss Jake before he went to bed) and have been mostly unconscious ever since. My husband has been taking on a lot more kid duty than usual; he is wiped out, appreciating more than ever all that I do. Every day, dude, I do this EVERY FREAKING DAY. If it weren't for the pain? This would feel like a mini-vacation. Pain killers are a beautiful thing, but also? Crappy. I hate feeling so fuzzy. I get really nauseated. So I will be stepping down on them shortly. It's sort of a "which-way-do-I-want-to-feel-crappy?" equation. Less pain = more nausea, less nausea = more pain. Trying to find just the right middle ground is not much fun. I will write more in a few days. A few pre-written posts will pop up in the interim. I want to shout out a big thanks to all my friends, real world and virtual, who have shown me their concern and support. It is much appreciated. Knowing that I was traveling to the hospital with so many well-wishes wrapped around me, that I had a community standing by to step in if things had gone poorly and their help was needed? Beyond priceless. I am truly amazed at my good fortune. Thank you, thank you, a thousand thank yous.